At the top of “America’s Got Talent” Judge Cuts episode, host Nick Cannon told special celebrity guest Neil Patrick Harris about his Golden Buzzer which gives him the power to send one of the returning acts straight through to Radio City Music Hall. Neil playfully hit the Golden Buzzer in the opening of the show, which caused a delay while a clean-up crew took to the stage. But, the act that Harris ended-up using his buzzer on surprised the competition back-stage. 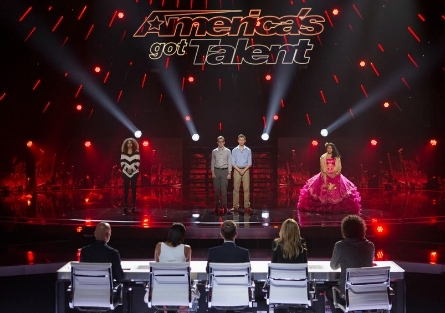 By the end of the episode, only seven out of the twenty returning acts will be pushed through to the next round of the competition. The rest of the acts will be sent home. The fist act up was Freelusion. They are made-up of two males and one female dancers who interact with projected images in their routine. Howard called them “major contenders. Patrick said it’s “magical and illusion”. Mel B. told them that they set a high bar that’s going to be difficult top beat. Howie enjoyed the act aside from Mel B.’s comments in his ear explaining to him the symbolism. The last time, Paul juggled a bunch of hats. This time, he juggled soccer balls. To the horror of Howie, Paul grabbed onto Howie’s neck while bouncing the ball off of his head, and gracing Howie’s face! Howard buzzed him because he said “at the end of the day, it’s a guy bouncing a ball on his head.” Mel B. said the harder it looked, the better it was. Howie did not like Paul touching his face. There are 28 members in their dance troupe ranging in ages 14 to 35 years old. Patrick said “That was super high energy. I loved that”. He also complimented their use of lights. Mel B. called it “perfect.” Howard thought that the routine was too busy and did not allow them to “hook into” them. Heidi loved it and said they had “great choreography.” Howie also loved it. She said she cuddles 10,000 hours. She names her cuddles, one called “gummy bear.” When she had all of the judges pile on top of Nick Cannon on a couch, they all put her through. Howard was astounded that the other judges did not hit their buzzers the first time. She asked for a volunteer again, which was their guest Neil Patrick Harris. She started with the “fortune cookie” cuddle, then moved onto “side winder”. She was soon booed by the audience and received “Xs” from all the judges. She ended with “the comfy” cuddle which was the most disturbing to the audience and to Harris. This is where Harris looked the most uncomfortable. Howard said he liked nothing from her act. Howie asked Neil what it was like to be “inside her fortune cookie”. Harris called it “a strange thing” to have on AGT. ALONDRA SANTOS – She returned to the stage this time wearing a fancy pink dress she called a cross between a quinceañera and Mariachi dress. Heidi said “it was so beautiful”. Neil said he loved it and she has an energy and spirit beyond her years. Howie said it’s the most beautiful quinceañera he’s been to. Howard reacted they have to remind everyone that she’s 13 years old and he enjoyed it very much. He said there’s something special about her. He’s a 26 year old magician. He said magic makes him feel happy. When the judges loved his first audition, he got emotional because he said he felt validated. This time around didn’t go as well. His coin (signed by Howard and Mel B.) in a can of soda took a bit too long to retrieve the coin – when Howard buzzed. Howard said because of his “quiet presentation”. Mel B. said there’s a mis-match on how Michale performs his magic. He brought his “secret weapon”, his dog Piffles. 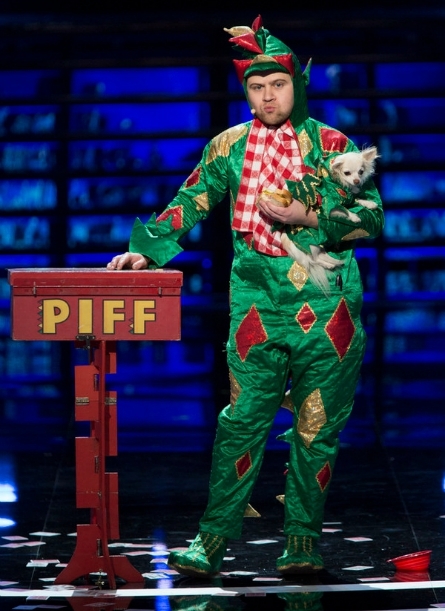 Piff invited Heidi back on stage. She wrote her name on a card. Then he said Piffles would find it by sniffing it. The card ended up making its way inside of a new can of dog food. He finished the trick off by kissing Heidi on the lips! 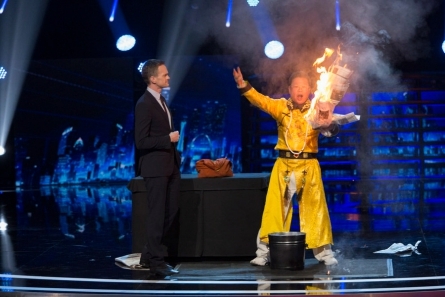 Neil said he loved all of it – the comedy the skill in magic and was blown away and used his Golden Buzzer on him. Piff gave him his sandwich in return. He was daunted by other acts who had skills like setting fire and singing and dancing. He said all he has are the words coming out of his mouth. His act consisted on jokes regarding dating. The audience and judges were all rolling with laughter. Howard said comedy is one of a favorite category on the show. Neil said he liked Mqu’s rapid fire style of joke tellnig. Mel B. said she didn’t want it to stop. Heidi said “finally someone that makes me laugh out loud.” Howie called him a great character. Howard said he owned the stage. He came out and swooned with a crooner style of singing. Howie said one hand was having a good time but the rest of the body wasn’t with it. Neil said it needed more spark. “3 Shades of Blue” is a rock band ages 17-20 years old. When they came out onto the stage, Howard told them that he really wants to see a rock band win AGT. Howard asked if they all really just dropped out of college. He told them in most cases, he’d tell them that, that wasn’t wise, but in their case, it was wise. Neil said “it leaves a very strong impression.” Heidi said they were good, it was tight, and they also have the looks too, as she flirtatiously smiled at them. Mel B. said “I wasn’t a fan of the song necessarily but I’m a fan of yours.” Howie said the little girls that dial in and vote matter. Acrobatic acts followed which the judges loved. Some were more impressive than others – such as X-TREME TRICKING AND TUMBLING whom Howard said they woke him up! Then there was the Grand Master Qi who returned and confident that he’d go into the next round because he got a standing ovation. He called Mel B. and Neil tot he stage to assist him. He tried to use their energy as they held onto newspaper to start a fire. It took a bit longer than expected. Heidi buzzed him. Then, she buzzed Howard and Mel B’s buzzer. The fire finally did start then blazed. Mel B. said the trick did work but if you take too long, you will get an X. Heidi said she wasn’t a fan. He left with four X’s from the judges. When Michael John, Myq Kaplan, and Keith Klein stood on stage to hear the results, the judges kept only one act. That was Mqy Kaplan. An awkward moment came when a family was divided on stage. It was mother & father versus son. Howie said it was “the toughest thing that I have ever had to do in the history of AGT.” The act moving on was Silvia Silvia and not her son Paul Ponce. Paul said he would have been more upset if it was him moving on and not his parents.